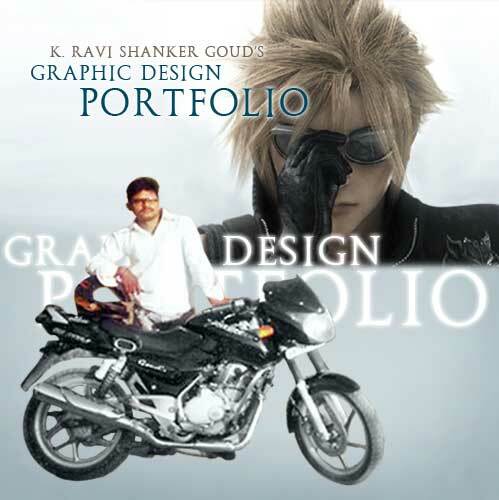 This is K. Ravi Shanker Goud u can call me Mr.A. I am a Visualiser/Designer, having 6+ years of experience in print and advertising media. What is and Y Graphic Designing ? Graphic designers produce design solutions to communicate their clients' messages with high visual impact. Graphic design solutions are required for a huge variety of products and activities, such as websites, advertising, books, magazines, posters, computer games, product packaging, exhibitions and displays, corporate communications and corporate identity, e.g. giving organisations a visual 'brand'. Working to a brief agreed with the client or account manager, a graphic designer develops creative ideas and concepts, choosing the appropriate media and style to meet the client's objectives. The work demands creative flair, up-to-date knowledge of industry software and a professional approach to time, costs and deadlines. Here is my portfolio. Please go through it and give me your views and comments on it.